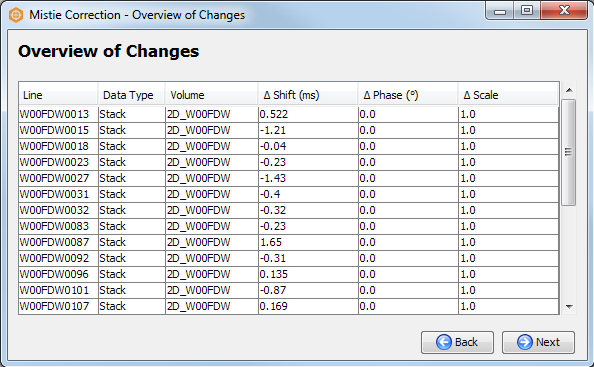 In Insight, you can automatically correct data misties between 2D lines and/or 3D volumes. A wizard is available to guide you in executing and completing the mistie analysis and corrections. The mistie corrections will then be stored as metadata on the volume and applied directly as the data is loaded and viewed. It is also possible to export the corrected volumes. For more information on how the mistie corrections are calculated, see How it Works (Automatic Mistie). In the Control Panel, open the Tool menu and click Mistie Correction - Automatic. This will open the wizard that will guide you through the steps to automatically correct the misties. After each step, click Next to continue or Back to return to the previous step to adjust the parameters. The following describes the steps in the wizard to automatically correct misties. Data Type — Select the type (class) of data to be corrected. Volume(s) — Click the Add icon to select the volume(s) to be corrected. Automatic mistie correction only operates in TWT and does NOT support depth volumes. Convert the volume to time using Time-Depth Conversion, then export and re-import the volume. 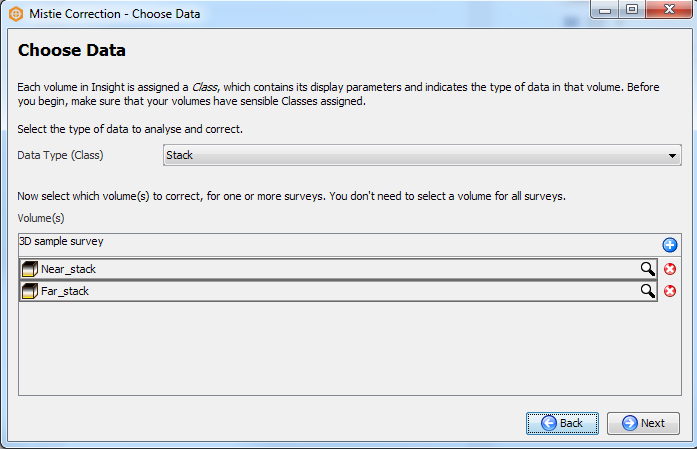 You are limited to correcting misties between volumes of the same data type of different lines or surveys. Reference Data — Select a 2D line or a 3D volume to be used as the reference data. This is optional. If no reference data is defined, all 2D lines or 3D volumes will be adjusted based on the results of the mistie analysis. 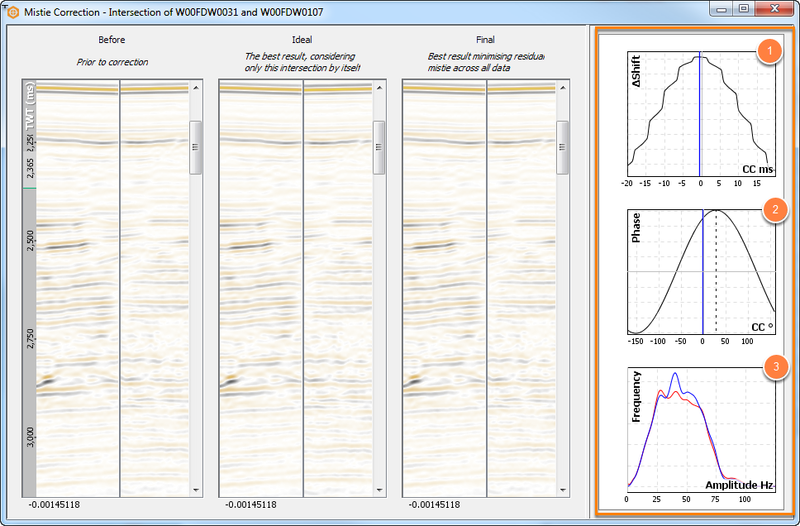 Correlation window — Select Fixed time to define a fixed TWT range for the correlation window. Type the time range at From and To. Alternatively, select Horizon and define a horizon to be used in the correlation window for the mistie calculation. Type the vertical range above and below the horizon to be used in the correlation window. 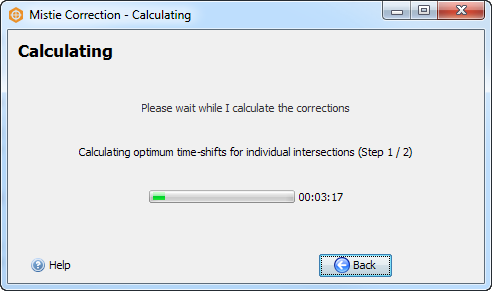 Maximum shift — Type the maximum time shift in the mistie calculation. Traces to correlate at 2D line intersections — Type the number of traces to correlate in each data set in the mistie calculation. By default, a single trace from each 2D line is compared, where they intersect. Increasing this number will compare multiple traces and use the average result, which may be useful in areas of poor data quality.This option is only available if you are dealing with 2D data. Max number of traces to correlate within 3D-3D intersection regions — 3D-3D intersections can contain a very large number of traces. To save time, no more than this number of traces will be compared, randomly sampled from within the intersection region. •	This option is only available if you are dealing with 3D data. CPU threads — The number of parallel tasks to run, to increase calculation speed. The default value (the number of CPU cores in the computer, minus one) is recommended, but will use most of your system's resources. If you want to work on other tasks while this runs, then you may want to reduce the number of threads. Tip: For more information, click on the Help icon at the bottom left of the window. 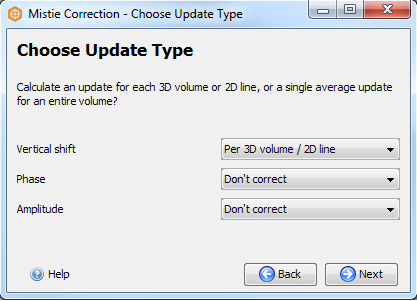 Per 3D volume / 2D line — Selecting this will apply a unique correction to each 3D volume and/or 2D line in the survey. Per volume — Calculate a single correction for a given volume and apply that one correction to all of its elements. In the case of a 2D volume, all lines will be changed by the same amount. Don't correct — Correction is not required. If you are correcting misties between two intersecting 3D volumes, the wizard will display an additional step allowing you to select a probe/polygon to constrain the mistie calculation within a lateral area. By default, Insight will use the entire area of overlap to determine the desired mistie correction. 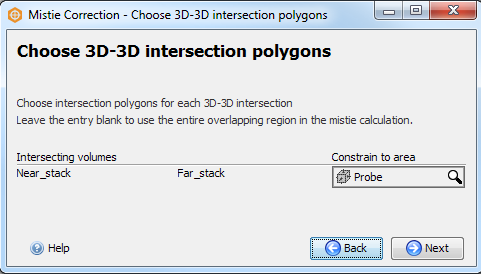 Constrain to area — Select a probe/polygon to constrain the mistie calculation within the selected probe/polygon. If you want to calculate the mistie for the whole overlapping region, leave this blank. Note: If you select a probe, it will only use the lateral area of the probe to confine the mistie calculation. When you have defined the update types, click Next and Insight will start calculating the mistie corrections. You will see a progress bar with the estimated time of the calculation process. Once the calculation is completed, the Overview of Changes window will be displayed. Here, you can see the shift, phase and amplitude scale corrections that will be made to every line or volume in the correlation window. Click Back if you want to reconfigure the correction parameters. Click Next to proceed with the corrections. Note: After you have applied the mistie corrections, you can also view this table by going to the Control Panel, open the Tool menu and select Mistie Overview Table (see Viewing Mistie Summary). Tip: You can copy the contents of the table to the clipboard by right-clicking anywhere in the table and selecting Copy as CSV. The results of mistie correction calculations will be displayed. In the table, double-click a row (or right-click and select Visualise mistie data for the intersection), to examine a selected intersection. 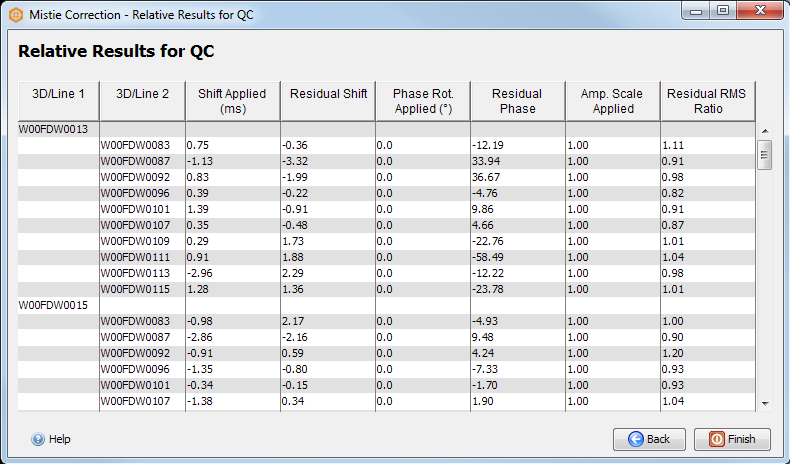 This will open an intersection QC view that compares traces from the intersecting volumes before correction, with ideal mistie correction applied and the final mistie correction applied. Tip: You can copy the contents of the table to the clipboard by right-clicking anywhere in the table and selecting Copy table as CSV. The top two charts on the right-hand side are independent. They show the change in correlation as phase or shift is changed. Based on the intersection view and graphs, you can inspect the mistie between the elements. On the Relative Results for QC screen, click Back to adjust the mistie correction parameters if you are not satisfied with the calculated mistie corrections or click Finish to apply the automatic mistie corrections based on the summary of the results. Once you click Finish, a warning message will be displayed to caution you that corrections will affect all users of this project. Click Save to save the automatic mistie corrections to the elements. Alternatively, click Discard to abort the corrections or Go Back to return to the Relative Results for QC window.